Yacht crew needs a lot of experience and professionalism especially for luxury yachts. 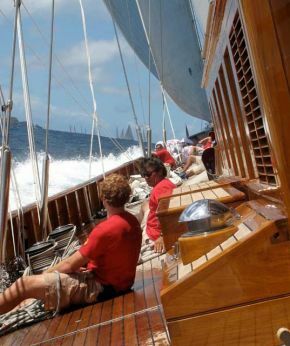 Experience and skillfulness of the crewmembers differ from one yacht to another. The captain is the sole authority on board a yacht or ship followed by deck officers, engineers chef and sous chefs, stewards, stewardesses and Deckhands. Navigating, Sailing, cooking, serving and cleaning are what our crews do at its best. Concerning mega yachts, they are the biggest amongst private yachts. Moreover in mega yachts, the helicopter is always ready to take you wherever and whenever you want to go. The yacht crew usually starts from three up to twenty people. You can even enjoy water toys and water sports acompanied by our deckhands on board. We consider that professional yacht crew is as much important as the yacht herself, since the quality of the service on board is crucial in the success of a charter. well trained and quality crew can make a huge difference between a joyfull yacht charter holiday or paid disaster which you dont want to be a part of it ! We own and operate yacht crew placement agency both in Turkish and international markets and thousands of yacht crew are using our websites to find a job and many yacht owners and captains rely on our website to find and locate quality yacht crew. crew aboard for english speaking crew and yat personeli for domestic Turkish crew.